AmpliFi's three-tiered Wi-Fi system will cover your entire smart home. Pros: Easy to add satellites, wide, fast coverage for most homes, good/better/best system choices. Cons: No Ethernet jacks on satellites, grounded three-prong jack on satellites, no dedicated parental controls. There are two prevailing Wi-Fi mesh approaches. One is deploying a base station connection to a cable modem with a second satellite blanketing the rest of the home with Wi-Fi. The second is a more distributed system in which there is a base station then multiple satellites, often one satellite for each room or area of the house. Surprisingly, the second distributed type of mesh system are actually cheaper than the two-piece systems, such as the good/better/best AmpliFi mesh systems being sold by Ubiquity. 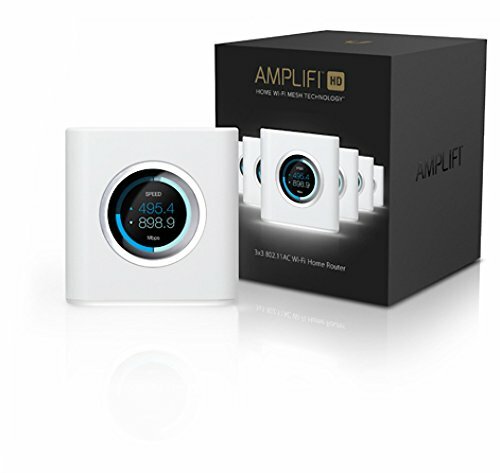 Instead of two pieces, the dual-band AmpliFi mesh systems, sold in good/better/best configurations, are three-packs consisting of a square base with a touchscreen and two tall, thin satellites. 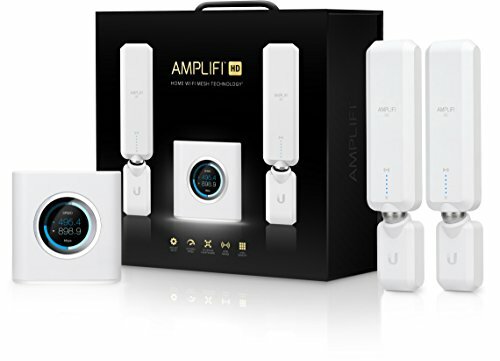 • AmpliFi HD (High Density, $349), also designed to cover 20k square feet but incorporating two extra radios to supply additional bandwidth. It is this last highest-quality system I tested, which is $50 less than the two-piece Netgear Orbi. The tall satellite nodes have a piece that can pivot at the top, and be pointed towards the base. AmpliFi's aesthetic is unique among all the mesh systems. Instead of nearly identical base and nodes/satellites, the AmpliFi base is a 4-inch square cube with a white monochromatic touchscreen on the front that cycles through four displays: time (12 or 24-hour), cumulative data, network speed, and system information, all of which also is found in the app. Other than the time, I found little use for the information on the other screens. In the app, you can adjust the screen brightness and switch to a night mode that turns the display off in case the base is placed in a room where its glow would be distracting. There are four Ethernet jacks on the back of the base, so it can serve as a router. Uniquely, the two-inch-wide, 10-inch tall satellites are actually two pieces; a three-inch tall base with a grounded (three-pronged) outlet, and a 7-inch tall upper antenna piece connected via a magnetic pivot. You can tilt the antenna 45 degrees down and around 180 degrees, all of which allows you to generally point it in the general direction of the base. As a result of this configuration, the satellites are designed to be plugged into three-pronged wall outlets like sconces, which could be a problem if you need to plug into an outlet strip. Most satellites from other mesh systems are free-standing using two-prong jacks. Unfortunately, the satellites lack auxiliary Ethernet jacks, so you can't physically connect a device to it as you can with satellites from other systems. AmpliFi HD's setup couldn't be simpler. An app guides you through the process, or you can use the touchscreen on the base combined with a web browser on a tablet or PC. A printed manual also is included. As with all mesh systems, you power down your modem, connect the base to it, then power both on. In the app, you can name the network and create a password; it's likely the system will want you do perform a system firmware update via the app, which should take less than five minutes. Once your system is back online, you simply plug the satellites into a grounded AC outlet in another room. Five vertical LED lights will flicker on the satellite then go solid in around a minute; the number of lights lit indicate the connection strength with the base. You also can check the connection strength of each satellite in the app. If the connection with the base isn't as strong as you'd like, you can pivot the satellite head so it's sort of pointed toward the general direction of the base. And that's it. AmpliFi was among the pain-free mesh systems to set up. AmpliFi will display download and upload speeds on its app. On my MacBook Pro, AmpliFi averaged around 110-150Mbps up to around 50 feet away with the usual wall obstructions. Downloading a 3GB file took around 10 minutes, ranking behind only Orbi and Portal. As long as you don't have too many people streaming 4K video simultaneously, AmpliFi ought to provide plenty of bandwidth in each room of most American homes. The app also is simple and straight-forward; you can view the performance level of each satellite or the whole system, pause service to each satellite or the whole system, and set restricted times for guest access. There are no dedicated parental controls, however. AmpliFi comes with a base plus two nodes in its basic set-up. 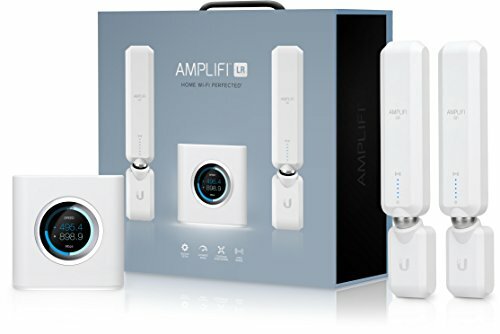 At $350 for three rooms (a base and two nodes), this premier AmpliFi system falls in the middle of the mesh price range. It's far less expensive than two-room systems from Netgear and Portal, but more expensive than multi-room systems from Plume and Luma. Appropriately, AmpliFi HD also falls in the middle of the mesh range in terms of performance, nearer to the fastest. I'd recommend AmpliFi HD for expansive homes with thick or steel-reinforced walls filled with mid- to heavy users. A system with a centrally-located base and satellites toward the sides of your home will get everyone the Wi-Fi they need, even upstairs and down. If your home isn't a mansion built like a fortress, you can certainly get away with the basic or LR AmpliFi system to save a bit more.